The urban Community centre is located adjacent to the south of open market district. Designated specifically for the needs of the homeless, elder generation, residents, would move to general assistance shelters (halfway homes) to live there for up to 12 months. The community centre’s purpose is three fold: to initiate the essence of community spirit, to help the children return to regular schooling, and to provide a stable, safe environment necessary for families to reassemble themselves. This purpose can best be achieved when the city’s institutionally provided social services are supplemented with the self-help that comes of a mutual supportive social environment amongst the shelter’s residents. The residential spaces housing a total of 10 residents-enclosed and are connected by a central outdoor dining space. 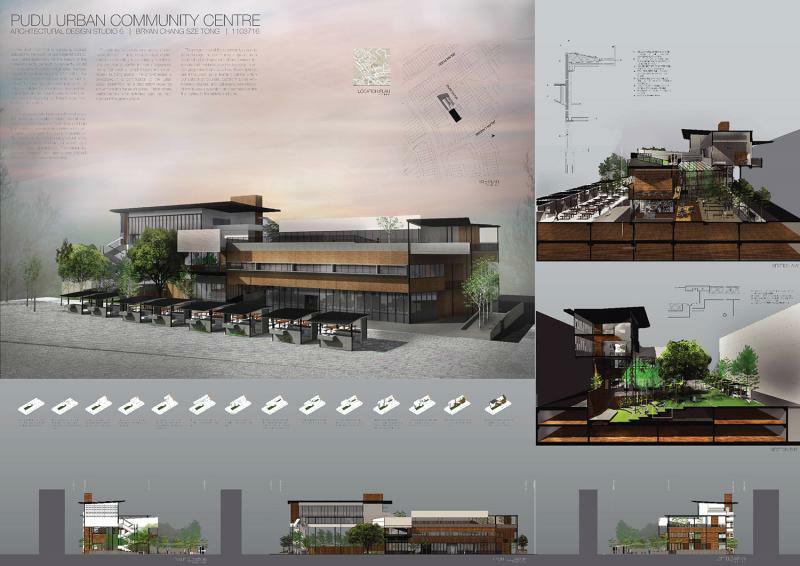 The community centre’s compact form also allows efficient provision of services and security. Through a series of terraces and a large central courtyard, sunlight penetrates all public areas, offices and apartments; the design optimizes energy use, comfort, individual control, feedback and adaptability. Roof surfaces will be productive- used to grow plants and food, generate power, and provides places to play and rest. Opportunity for interactions are continued inside the community centre’s skylit central corridor connecting to its primary functions. The community centre is mainly separated into a main open air amphitheatre and an enclosed building space. The amphitheatre is celebrated in a continuation of the Jalan Sayur street flow as a destination receiving and embracing the existing tree. This is where performances and activities can be held amongst the green space. The programme of the community centre is to encourage the community to gather as a social club for all ages who share common interests and hobbies to come together in organizing classes and activities. These spaces are introduced as a learning centre which consists of art courses, crafting making, embroidery classes, and calligraphy workshops. There is also a polyclinic and wellness centre that caters to the elderly and sick. The Community centre is used by the community. Hence, it should be for the community. Sharing and learning from each other as a community.